I really enjoy that there is a forum for the fans to talk about everything related to this epic series. 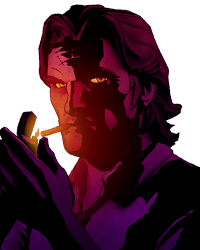 The Wolf Among Us is really damn unique, immersive, interesting, artistic (we all love that Noir look), well-thought and true to the comics. Now, what if we made a whole discussion where we brainstorm altogether for the editors and creators of the game? I just want another "Glass him" option, really. To the Woodsman, preferably - for old times' sake. I'd prefer it in a situation where it would once again trick the unaware players - they'd think it's a drink offering, where in reality they'd try to smash some character's head open with a glass. I would laugh for days. That option is still the trolliest choice TTG has ever done IMHO. I would love for them to put another deceptive choice like that (a minor one of course) that would catch us off guard. I'm picturing an option where you have to hand something over to Snow and she is like "well? ", so you click [HAND HER]. JeSuS cHrIsT, I hope they do something like that. Bloody Mary's return is a must for me, even if it's only a subplot or brief "resurrection," such as Bigby getting glamoured as her. Come to think of it, Bigby should be glamoured one way or another during S2. It's an idea brimming with too much story/gameplay potential to pass up. If the new season is set around Christmas, an appearance by Santa Claus is a must. Santa Claus! Yes! Would be hilarious if he was an alcoholic and womanizer too. Bloody Mary's return is a must for me, even if it's only a subplot or brief "resurrection," such as Bigby getting glamoured as her… more. Come to think of it, Bigby should be glamoured one way or another during S2. It's an idea brimming with too much story/gameplay potential to pass up. If the new season is set around Christmas, an appearance by Santa Claus is a must. Sorry, Santa Claus has already shown up in the Fables comic, and he isn't alcoholic or a womanizer. In fact, he's pretty much the symbol of childhood joy everyone always perceived him to be. I'm actually not disappointed at this. It's nice. I think they should add more things to interact with. In season 1 most of the time you just happen to stumble on all the right hints. Everything you look at helps you collect further evidence. If they presented more things to interact with (more realistic in my opinion), and some of those were useful -and some others not-, I think it would be far more interesting and challenging. Is the unplugged lamp really important? Or is that missing ornament the true clue? I am also rooting for some sort of "detective notebook", where you can actually look at all the evidence you have collected/interacted-with throughout the game. There you can connect dots that will determine your theories later on. Some theories would look correct -but not be so (like batman telltale). More things to discover, more clues to fit together. Basically, following characters are pretty much God-like (if not Gods already) in terms of their powers in Fables. Yes! Bigby's father. I know that character but I haven't read the comics, yet. Interesting to know, maybe some of those could the the antagonist in season 2? It would certainly make a great meme addition to the fandom. I just screamed. JeSuS cHrIsT, I hope they do something like that. Bigby literally hates his father and doesn't meet him again (after their several confrontations in the Homelands) until in the comics. Dark Man, well...the reason he can't appear is pretty much explained in the comic (which I won't delve into because it goes heavily in Spoiler territory). Santa, well he is normally just associated with children despite his immense power, and is uninterested in all other things. With Hope, while possible, I kinda hope not because literally every character on this tier (God-level tier) is basically way too OP. Maybe she could be one of those shadowy antagonists who pulls strings from behind, but frontal assault on her would be impossible. Adding to that, I'm personally hoping Telltale has its own antagonist, and not reuse season 1 villains (i.e. Crooked Man, Bloody Mary). With using Fables comics villains, while I'm not totally against that, their inclusion must be plausible, and they must not be OP villains. Yes! Bigby's father. I know that character but I haven't read the comics, yet. Interesting to know, maybe some of those could the the antagonist in season 2? Good to know. Hope peeks my interest, and I agree she could be a shadowy character, although it would be too similar to Crooked man. Telltale has said the game won't continue after the first one, that it will be a different timeline, so this could be a real good opportunity to make some interesting antagonists. Nah. Bigby literally hates his father and doesn't meet him again (after their several confrontations in the Homelands) until in… more the comics. Dark Man, well...the reason he can't appear is pretty much explained in the comic (which I won't delve into because it goes heavily in Spoiler territory). Santa, well he is normally just associated with children despite his immense power, and is uninterested in all other things. With Hope, while possible, I kinda hope not because literally every character on this tier (God-level tier) is basically way too OP. Maybe she could be one of those shadowy antagonists who pulls strings from behind, but frontal assault on her would be impossible. Adding to that, I'm personally hoping Telltale has its own antagonist, and not reuse season 1 villains (i.e. Crooked Man, Bloody Mary). 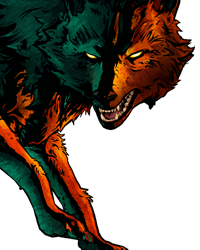 With using Fables comics villains, while I'm not totally against that, their inclusion must be plausible, and they must not be OP villains.